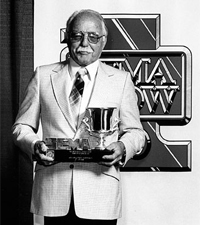 SEMA Hall of Fame - Kenny Harman, 1979, Harman Collins Inc.. Considered an innovator, Kenny was the founder of Harman Collins, a producer of high-performance distributors and related ignition components for the Ford flathead V8. The Harman Collins units were used extensively in early-days circle track competition and drag racing, and can be found today on the engines of nostalgia race cars. He also had a shop that focused on motorcycle camshafts, called K-H Cams. Kenny’s background included racing Muroc and Rosamond dry lakes.